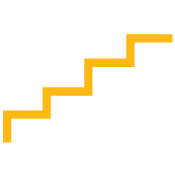 Please click here to go directly to our Stairway to Value article in PDF. In our practice, the Value Band Plan has become the most popular long-term incentive plan among the business owners anticipating a change in control within the next two to seven years. Our clients often select Value Band Plans (VBPs) because these plans elegantly balance risk and return across the owners and executives. VBPs provide a scalable incentive: they enable executives to receive an increasing percentage of deal proceeds based on company value at change in control. They are conceptually simple plans. No annual valuations are required. There is no buy-in or tax friction at grant, and the plan units can be dynamically reallocated to the highest performing executives. In short, when properly designed and applied in the right context, VBPs are a highly-effective long-term incentive platform. Nevertheless, VBPs are not as well known among business owners as they should be. 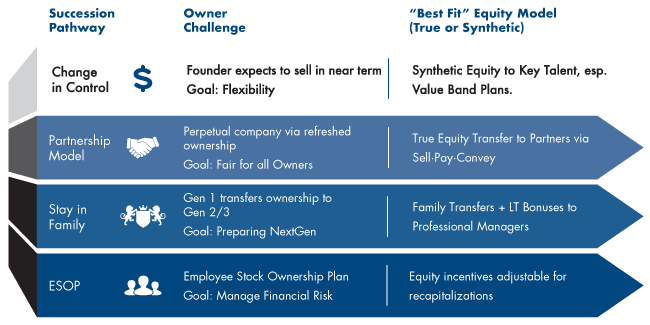 For starters, 54% of all private companies have no long-term plan at all.1 And many of the remaining companies have traditional equity plans, which can expose owners to unaffordable or inequitable payouts, conflicts between legacy and new talent, excessive tax bills, and other factors that can threaten the ongoing viability of the underlying company. This paper introduces the VBPs and highlights their key benefits and considerations for private companies. Through the paper, we use a sanitized client example, TradeX One, to demonstrate the “best fit” characteristics of the Value Band Plan. TradeX One, a trade advisory firm, had a near-death experience.Its three owners established a stock appreciation rights (SARs) plan to attract, retain, and reward key executives, planning to sell the business before the rights vested. As often happens with private companies, the sale didn’t materialize on schedule. Instead, the company experienced a brief period of explosive growth in which it reached a $400 million valuation. Sensing a financial windfall, many of TradeX One’s key executives exercised their SARs. The result: a $16 million cash call that sucked needed capital out of the company. The mistake TradeX One’s owners made is a common one: Business owners often fail to align their company’s long-term incentive plan with their chosen succession pathway—in this case, a sale to a third party (also known as a change in control). The owners of TradeX One had all the right motivations, but they never anticipated how the firm’s success might trigger payouts that could threaten its existence. Owners of private companies who are on a path to a change in control owe it to themselves to become more familiar with the strengths and weaknesses of long-term incentive plans. In particular, they and their advisors should learn about one of the most powerful and flexible of these solutions: The Value Band Plans. VBPs facilitate successful capital succession via a change in control. We have designed these plans across a diverse set of private companies with disparate cultures, histories, and business characteristics. And when owners exit their companies, we have seen the plans help them realize the maximum potential from these highly contingent events. VBPs are a relatively simple and cost-effective synthetic equity incentive, with no buy-in cost for recipients.2 They grant plan participants a pre-defined portion of the transaction value at a specified ownership transition event in the future, if certain conditions are met. 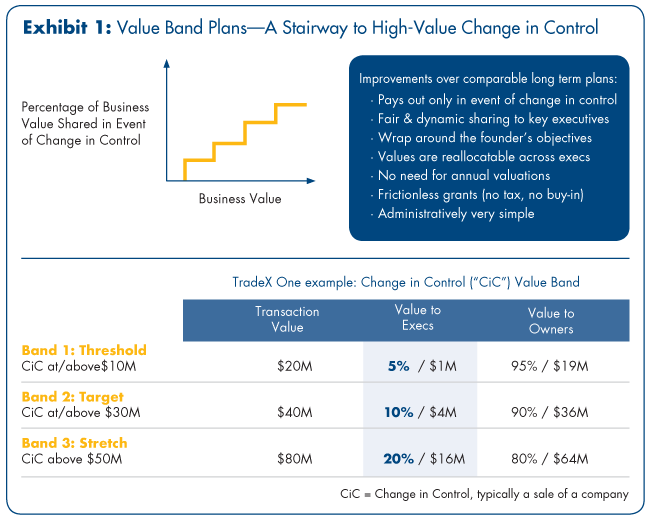 The key to VBP effectiveness is its ability to motivate the participants to stay loyal, drive up company value, and support the transition event.3 This is achieved by carefully sizing the plan’s “value bands” (i.e., the different levels of plan payouts based on the amount of the transaction proceeds) and specifying a set of prudent requirements for payouts. VBP payouts are dynamically priced based on two factors: 1) the business value achieved at change in control and 2) the percent of the deal value attributable to the plan. Thus, “the better we do, the better you do” economics of VBPs ensure that key talent is aligned and focused on the same goal as owners: building equity toward a high-value sale of the business. See Exhibit 1. The key to VBP effectiveness is its ability to motivate the participants to stay loyal, drive up company value, and support the transition event. TradeX One’s owners turned to a VBP after their near-tragic experience with SARs. They crafted a plan with three graduated value bands, defined by value the owners would achieve at change in control. The owners committed to provide the plan’s participants 5 percent of transaction value at threshold performance; 10 percent at target performance, and 20 percent at stretch performance (see Exhibit 1). This enabled the company to direct its strategic growth capital to its needs and its owners’ needs as opposed to funding interim plan payouts. It also freed the owners to expand participation in the VBP to include key technical talent, an employee group in which top-flight candidates are increasingly difficult to acquire and retain. Long-term incentive plans are a means to an end. Tactically, they enhance the recruitment and retention of key talent. Strategically, they play an essential role in enabling ownership succession. Different kinds of plans support different succession pathways. We highlight four most common pathways below including Change in Control, Partnership Model, Stay in the Family and ESOP. Of course, no matter what incentive plan you adopt, it is critical that it harmonize with your chosen succession pathway. Often, they are designed to payout only if a sale occurs. 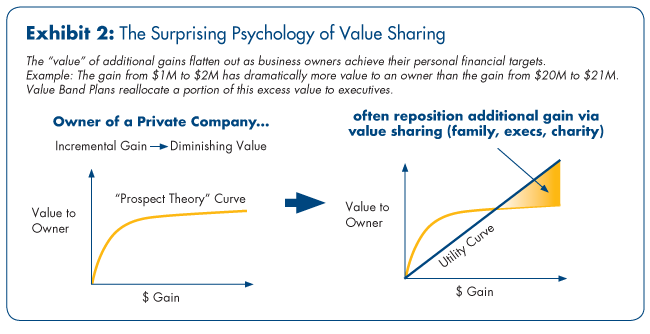 Moreover, the value share can be wrapped around the owners’ unique financial situation – thereby sharing as little or as much as the owner feels is fair given the situation and timing. Their features, such as payout triggers, value drivers, and vesting, can be customized to align with owner, executive, and company goals during the plan design stage. They unite owners and key employees in a collective goal—the drive to create long-term business value. The principal distinguishing feature of VBPs is their graduated bands. As the company’s value at change-in-control exceeds specific, predetermined levels, the value assigned to the plan’s participants can step up into a new band. Thus, owners can offer key talent a graduated share in the growth of the company without risking their own or their company’s financial well-being. Often owners will resist the idea of incentivizing key talent for fear of placing their own financial well-being at risk. This creates a mental conflict in which owners struggle to reconcile their desire to avoid giving too much away with the need to retain the company’s precious key talent. This is a dangerous psychological trap, but economist Herbert Stein discovered that it is avoidable. He argued that most business owners are not like investors, that is, they are not “maximizers” who seek the greatest possible value for themselves to the detriment of everyone else. He found that as owners attain most of their financial goals, they are willing to share incremental gains with the talented people who have helped them grow their businesses (see Exhibit 2). When TradeX One’s owners realized that a VBP eliminated the risk to their own financial well-being, they acted just as Herbert Stein predicted they would. They willingly agreed to a plan that would share a higher portion of financial gains in excess of their needs with the key employees who would be instrumental in the growth and eventual sale of their company. Award allocation is an essential feature for unlocking VBP flexibility. When designing VBPs, owners can choose either a static (or fixed) award allocation or a unit-based award allocation or a combination of the two. A static allocation provides pre-determined and fixed awards. It is most suitable for a highly-stable legacy management team deserving of a fixed carve-out benefit. A unit-based allocation offers owners far more flexibility. Here, the value-sharing carve-out is divided into units and the units are awarded to participants. To ensure that the unit grants are aligned with the strategic goals of owners, the grants can be made subject to individual or group achievement as defined by key performance metrics, such as the quantity, quality, efficiency, and repeatability of earnings. Returning to TradeX One, let's presume that Zachary, a key executive, deserves 20 percent of the plan units. If there are 100,000 authorized units in the plan, the owners would award Zachary 20,000 units. After a few years, Zachary continues to be a high performer, and many more people were added to the plan with the total number of authorized units increased to 200,000. To make Zachary "whole," he could receive an additional 20,000 units keeping him at 20 percent of the total authorized units. In short, VBPs offers owners far greater flexibility than a stock option or a restricted stock plan, and they eliminate the confusion that the timing and pricing complexities of the traditional plans can cause among key executives. Total Quality Management pioneer W. Edwards Deming decried short-term incentive plans. His complaint: Often, executives will go to great lengths to achieve these short-term rewards even at the risk of sacrificing long-term investments needed to create true shareholder value. Furthermore, executives tend to heavily discount long-term rewards, especially when they are based on complicated vesting schedules, moving targets, and long payout windows. VBPs avoid these pitfalls. First, their payouts are tied to the same change-in-control event as owners’ payouts. When owners get liquidity via a sale, so do the plan participants. Third, key employees often find that their career opportunities are expanded by a high-value strategic sale. A larger company can provide correspondingly greater responsibilities as well as opportunities to achieve the founder’s broader vision that may have been inhibited by the constraints of a smaller private company. Witness what has happened at TradeX One in the past several years. Since the plan has been in place, the company’s key employees have successfully embraced the ongoing volatility in global trade and fueled company growth beyond the owners’ expectations. Currently, TradeX One is on track to exceed $1 billion in value, at which time the owners will pursue a sale. If successful, the owners will share more than $200 million of the transaction proceeds with TradeX One’s key employees. Like most forms of synthetic equity, the proceeds distributed under VBPs are taxed as compensation when paid, not as property. Accordingly, key executives owe no taxes when they are granted an award or when they meet the plan’s service, performance, or other vesting requirements. Tax is due when payouts are made, usually at change in control. By and large, private companies have not aligned their long-term incentive plans with the succession pathways to which their owners aspire. The result: company growth, owner succession, and key employee retention are placed at risk. It’s hard to overestimate the value of establishing incentive and succession alignment across owners and key employees. Incentive plan misalignment is not an HR issue; it is a strategic impediment to growth. Properly designed and tested VBPs foster this alignment and, in doing so, help private companies climb the stairway to successful change in control. VBPs are affordable and simple to establish and maintain. They assuage owner fears of overcommitting to key employees, and they align the efforts of key employees with the goals of owners. Bottom line: if you aspire to have a high-value change in control, it’s time to take a closer look at Value Band Plans. As you consider your desired succession pathway, here’s a critical question: How well does your company’s long-term incentive plan align with and support your capital succession plan? The following Q&A explains a few VBP design features that can help meet the needs and desires of owners and key talent in private companies headed toward a change in control. Q: Can VBPs be crafted to share upside value only after owners get a return on their capital? A: Yes, owners can set a floor below which the plan does not pay out. At TradeX One, for example, the owners set the plan’s floor at $10 million. Q: If several executives leave prior to a change in control, will the remaining executives receive a windfall? A: No, the separation of executives does not automatically benefit the remaining executives. VBPs are based on plan units, and the value to any executive is based on his or her awarded units divided by total authorized plan units. Further, there is no obligation to award all the units under the plan. Q: Do the sharply-defined value bands trigger some game playing by the owners to either get above or below a value band? A: Some owners are comfortable with a few bands and big incentive targets (a kicker). For others, the plan can include more bands at smaller intervals or, in some situations, a smooth line, such as higher value band award for every $1 million in transaction price. Q: Many deals have large escrow and earnouts that are paid long after the sale. How are those handled? A: Typically, plans require executives to remain employed by the acquirer to receive a share of escrow and future earnouts. Executives who remain are trued-up for their value share after specified earnout and escrow payments are received. Q: What if the company is not sold because owners decide not to sell or no buyer materializes? A: Because VBPs are intended to be developed outside the rigid designs of 409A applicable to nonqualified deferred compensation plans, owners can provide discretionary payments to plan participants at a time and in a form that suits their situation and sense of fairness. As circumstances change, the plan can be modified or replaced to reflect current realities with few or no tax implications. Q: Can a portion of plan value be paid to executives only after a service or performance period following change in control? A: With careful design, a portion of plan benefits can be subject to a “golden handcuff” while keeping the plan outside of 409A and managing the tax implications. Value Band Plan: "foreground" or "background"? In some cases, owners will position the Value Band Plan as the primary focus, AKA, the “foreground plan”. The message to executives: Our company may eventually engage in a change in control, and if so, we want to make sure you are taken care of via a fair compensatory bonus. The VBP truly aligns our interests. Sometimes more tact is needed. Some organizations, owners or executives may not be ready to promote the idea of a possible, future change of control. In that case, here are a few ideas. Consider discussing the value band plan with executives as a concept, but delay formalizing the plan and/or awarding any units until the time is right. Remember, no valuation is needed with a VBP — so the plan rollout and threshold values are independent of time. Cash Bonus Plan rewarding loyalty. This plan determines benefits at the end of a performance year and then pays out a few years later to the executives still gainfully employed with the company. The cascaded bonus plan is often the primary focus, or "foreground" plan. The Value Band Plan, as described in this paper, is the “background” plan. The plan can be rolled out as a thoughtful incentive to the executive team, but not suggesting an imminent change in control. Business Continuity Plan benefiting key executives. This plan establishes a business continuity trust funded with life insurance for the benefit of executives in case the primary founder passes away. This trust coordinates with the owner’s overall estate plan. This is the “contingency” plan. Owners who deliver an overall value-sharing message such as a cascading bonus plan, VBP, and business continuity plan communicate at a higher (more intrinsic) level of respect. 2 Mark C. Bronfman, Synthetic Equity: Powerful Incentive Plans Fostering Owner Succession in Privately-Held Companies Sagemark Consulting, 2013. 3 Value band plans should fit into a company’s overall compensation philosophy. Long-term equity-based awards, like value bands, should be married with fair salary, performance bonuses, and long-term deferred cash incentives. 5 Early stage companies with very modest enterprise value can transfer equity with limited tax or buy-in friction. See “The Founder’s Dilemma” by Noam Wasserman. 6 As always, a tax advisor should be engaged to examine the structure, timing, entities, and income associated with a VBP to maximize the tax benefit of the compensatory expense. 7 A fully-fledged value band plan addresses other payout topics such as termination without cause, death, disability and rights to value after separation. Care should be applied relative to 409A tax topics.